The United States District Court for the Western District of Michigan (the “Court”) recently dismissed a lawsuit seeking recovery of property damages filed by the property owner against a motor carrier and its truck driver. 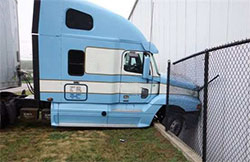 The case hinged upon the Court’s analysis of whether the accident and resulting property damage arose from the tractor-trailer's use as a motor vehicle. The defendants argued that it should, while the plaintiff asserted that Michigan’s owner’s liability act - which has a longer statute of limitations - should apply instead. The Court ruled in favor of the defendants, and held that Michigan's no-fault act governed the dispute. Because the plaintiff’s lawsuit was filed more than one year after the incident, which was outside of the no-fault insurance act’s statute of limitations, the case was dismissed. The accident at issue involved a tractor-trailer that was on a downhill grade across from the plaintiff’s warehouse. The unattended tractor-trailer rolled down the hill and into the warehouse, causing property damage but no personal injury. Dirk Beckwith at Foster Swift represented the motor carrier and its driver.